Often referred to as “PayPal 2.0,” Request is a decentralized network that allows anyone to request a payment (a Request Invoice) for which the recipient can pay in a secure way. All of the information is stored in a decentralized authentic ledger, which results in cheaper, easier, and more secure payments, while creating a wide range of automation opportunities. The aim here is to create a financial system that could potentially become the standard for invoices, accounting, auditing, and payments in cryptocurrencies and fiat assets. The Request team has gained a lot of credibility due to their previous experiences (they created Moneytis, a money-transfer company), backing by Y Combinator (one of the largest accelerators in Silicon Valley, who backed companies like Airbnb, Coinbase, Reddit, Dropbox, etc. ), as well as their regular and transparent updates, rare to encounter in the cryptosphere. In Q4 of 2017, Request also came out with a minimum viable product, which functions surprisingly well and shows, in a snapshot, how big of a problem they are setting out to solve. What is also important to know is that Request is not just “payment processing”, but also includes benefits such as efficient and automated invoicing, identity protection, smart auditing, fast and cheap value exchange, and cross-currency transactions (meaning that you can pay in whichever currency you want, and the receiver gets the currency they desire). Welcome to the world of tomorrow, where you can accept any currency, automate your finances, and remove costs related to running personal and corporate finances. Request Network has positioned itself against giant payment providers (such as PayPal, Stripe, etc.) and powerhouse credit card institutions (like Visa, Mastercard, etc.) – companies that have existed for decades and proven to be the backbone of connecting the world. However, with time, accumulated databases and increasing revenues, corruption, greed, and need for control have guided those companies on a path that doesn’t serve the users, but the undertakings themselves. This is where Request comes into play – a payment solution that doesn’t force the user to surrender personal information or authority to a third party, and where information will never be shared or stored on the retailer’s side. Not only does it promote security, as there is no central body collecting information waiting to be breached and leaked, it also makes payments much quicker, straightforward, and cost-efficient. According to the whitepaper, “a marketplace usually pays between 1.5% (Stripe) and 7% (PayPal with inter-currency) of the transaction amount to accept a payment”. Now compare that to the cost of creating a request – between $0.001 and $0.20, depending on the invoiced amount and the selected features. 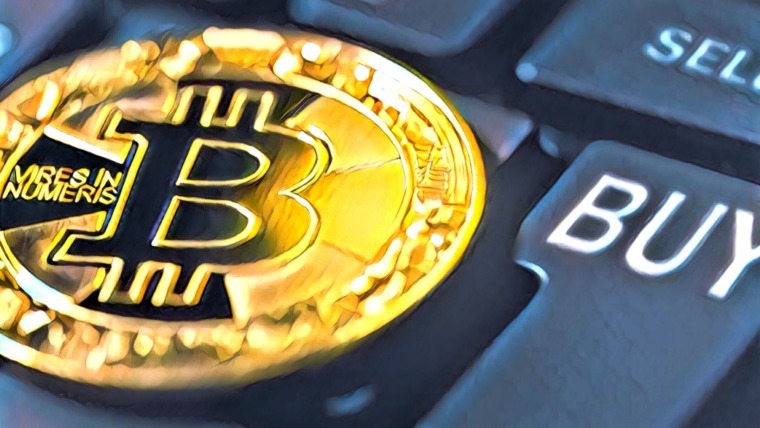 Additionally, since cryptocurrencies utilize a push mechanism (which are inexpensive – for example, in Europe, SEPA payments are free and soon to be instant) as opposed to the traditional pull mechanism, we can expect transaction fees to drop significantly while allowing no authorization to pull from your account, because only you have the power to push a precise amount from your wallet to the recipient. The reduced cost, coupled with the possibility of not revealing sensitive data and surrendering authority, makes Request Network superior to its competition, regardless of their current scale. Additionally, since banks’ security relies on access control, it allows no competition to be formed that might provide better options, leading to a monopoly where people are forced to wait and suffer for change. With Request, anyone can audit the code, suggest improvements, or even fork it in extreme scenarios where trust in the network is no longer present. Banks and payment processors mask their “closed environment” as consumer protection, while in reality they just want complete control and for no one else to have access. In the traditional model, your financial information is stored by both the marketplace and the banks, meaning that we are releasing an identifier that allows banks to pull money from your account without authorization. Since businesses have come to depend on electronic data and computer networking to operate, they are growing databases of personal and financial information and storing them in a centralized location prone to being exposed to breaches and compromises, leaving countless people vulnerable to identity theft. However, with Request Network, we are ensured consumer protection in a transparent and decentralized way – by giving users direct and full control over their currencies, wealth, and transactions. Request won’t force you to reveal your identity and data with every transaction, nor ask you to sacrifice control to centralized bodies in order to transact. Furthermore, when we are ultimately moving away from requiring centralized exchanges, which basically act as crypto banks (controlling your money and having ownership of your private keys), Request can also target the huge security issues that reside in that. No more would people be forced to hold their money on exchanges due to their current benefits of liquidity, as they can interact freely without ever requiring the use of a third party. Currently, people rely on those exchanges to convert one token to another, while customers need to own a certain currency that the merchant accepts. Request Network, in addition to improving adoption and everyday easy-of-use, lets you transact/exchange freely without that limitation (refer to paragraph “Cross-Currency Settlements”), while giving you complete ownership and security over your finances (by controlling your own private keys). The experience of using Request Network can obviously not yet be fully tested, but in theory, during the checkout you will be able to pay very easily through automatic request detection, where you only need to swipe left to reject or right to verify the transaction. 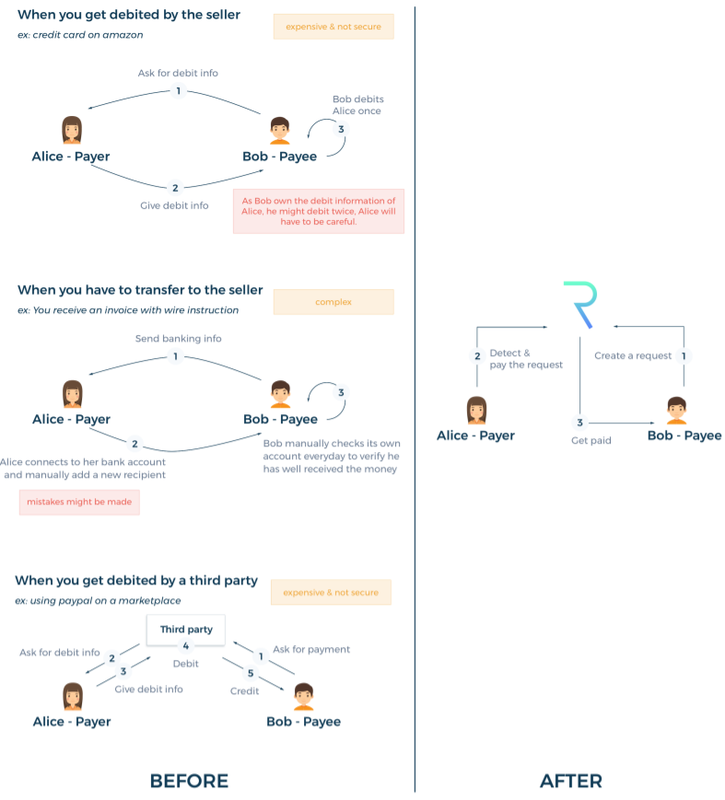 To articulate it better, here is an image explaining the process of traditional payments versus Request payments. What also plays into the experience is how customers, merchants, and companies are able to transact between each other without hassles. For instance, PayPal is known to close and freeze thousands of accounts on a daily basis, making your funds unavailable for 180 days if there is something going on that they don’t like. Mostly, this is extremely unwarranted and creates a multitude of issues and headaches for merchants or companies looking to transact fast and efficiently. It can also hinder progress and growth of a new company in the development phase, while PayPal uses that money as leverage for its own interests. Second, it is the easiest thing to scam merchants through PayPal, as Paypal almost always resides with the customer and never conducts proper dispute evaluations. There are countless websites that have been created with the sole intention of resisting their monopoly and exposing their unethical business conduct. Problem is, there is no real alternative aside from payment processors to which the majority of merchants don’t even get access to (and mostly have the same problems), so people are left with no options but to risk all their money being seized due to false claims. This is only part of the problem people have to deal with, not to mention scams, frauds, identity thefts, random payment reversals after confirmed shipments, ridiculous unwarranted fees, etc. 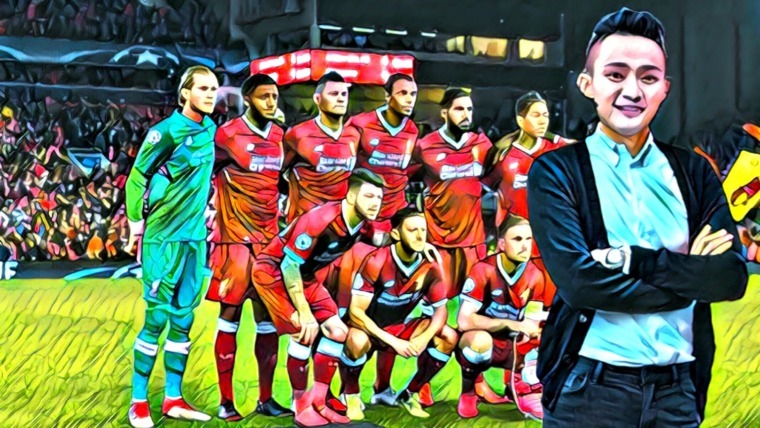 Targeting this type of negative experience, REQ has a solution, and while it might take time to integrate it, it is something to look forward to. Not only will you be able to confirm payments with a single swipe, you also don’t have to go through the painful registration and verification phases, account freezes, surrendering of data and finances and a variety of other problems. Using Request, both you and the marketplace have access to the same digital invoice and can refer to it later. This invoice can then be used as a proof for taxes or insurance, for your own reporting, or for sharing it with your company as a business expense. Additionally, once we reach a point where there are additional layers added to the network, as well as smart contracts, we can expect full automation of accounting, where every piece of bookkeeping is done for you. In the future, we can probably expect Request Network to gather and track things for you, and act as an automated virtual assistant taking care of your finance reporting. For more information about this, please refer to the paragraph “Automation of Jobs: Accounting and Auditing” below. An additional benefit of Request Network versus traditional payment processors is the extensions platform built on top of Request. With it, anyone can create advanced payment conditions, which promotes flexibility and innovation in finances. This, too, can be coupled with extra layers and smart contracts to automate personal and company finances. Furthermore, Request also acknowledges that companies have different needs and might require additional functionalities relative to their unique operations. For this, Request has made sure to create versatility to be able to customly develop on top of their platform, while giving access to all basic services and frameworks. This way, organizations can begin to use their services easily, while allowing them the capability of developing new frameworks and functionalities over time when required. Company A wishes to pay for the services provided to them by Company B. 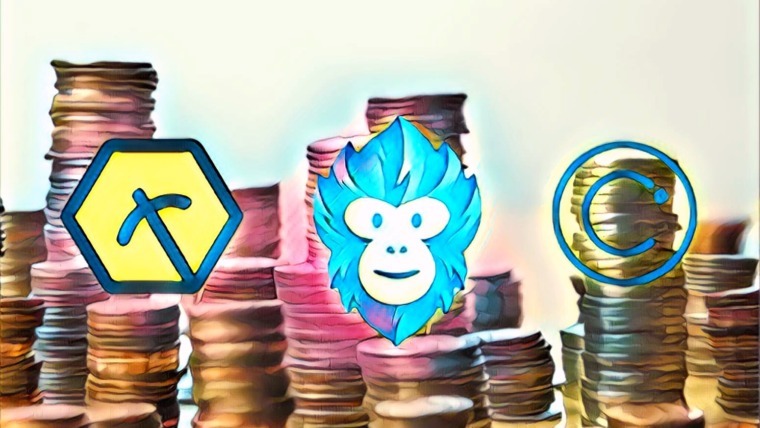 Now, instead of Company A having to buy Company B’s tokens, they can just send them whatever currency they want (be it their own token, fiat, ETH, WTC, BTC, etc.) and Company B still receives the currency they desire. Let’s say Company A sends BTC, but Company B wants all transactions to be settled in their own B token. What happens now is that, almost instantly, the BTC will be automatically exchanged to REQ, then from REQ to B Token, and sent to Company B. This will create a huge demand for REQ in the future, as there will be a lot of people transacting in cross-currencies, be it someone buying services from a company or child-chains interacting between each other. If people want to transact instantaneously without limitations, they can do that, and each participant in that transaction will use REQ as intermediary. Reputation system: always be paid on time thanks to a reputation system for good and bad payers. Validation: you send an instant request and the recipient is immediately notified. You know when your request has been validated by the recipient right away. Escrow and down-payment: you can easily add payment options and functionality. Invoice management: you don’t need to manage your customer invoices by email anymore, but through an application where everything is easily compiled and accessed. Sharing via a ledger: your books are automatically updated as invoices are issued and paid. This means no more invoice duplication between two parties, less time managing everything, and no risk of invoices loss. Connecting sales invoices to the payment: Today your invoicing software is disconnected from the payment of your customer invoices). With Request, the invoice is the transaction. When it comes to bookkeeping, Request provides companies a real-time automated accounting solution, which provides more information and overview to finances, while allowing for better, cheaper, and faster financial management. Additionally, accounting systems can also become digitized, removing the need for repetitive documentation checks and constant updating and filing, making companies able to allocate budgets more efficiently to value-added tasks involving analysis, expansions, strategies, marketing, partnerships, etc. Furthermore, due to the automation capabilities and efficiency in the platform they are building, the need for a costly (both in time and money) auditing is not required, since companies can keep accounts in a decentralized, confidential, and shared database, while verification is done by the system which requires limited oversight. Traditionally, audits require the auditor to inspect a purchase order, invoice, terms of sale, evidence of cash receipt/payment, and a journal entry, which can sum up to hundreds of transactions for bigger companies. 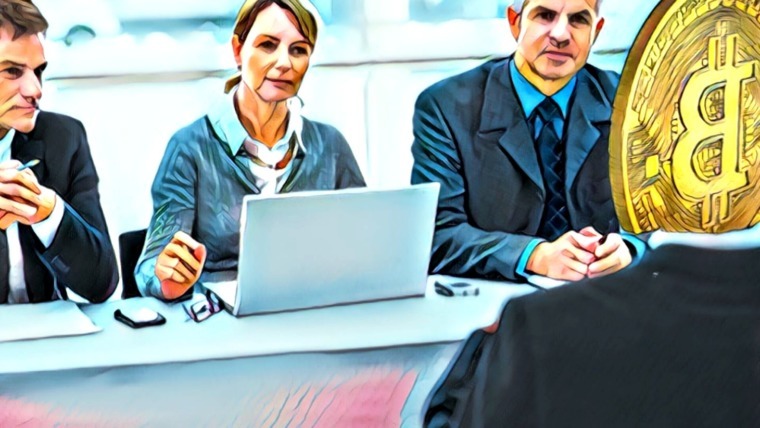 Also, the company being audited is required to allocate their resources to gather supporting documents, while the auditor is required to comb through the details matching up all the pertinent info to address the audit assertions, leading to hundreds of hours of audit work. By compiling all of this information in one place, while adding extra assurance and further automation services available in the future, both the time and financial cost can be reduced drastically in this area. Additional benefit of a transparent, decentralized payment, invoicing, and auditing platform is allowing government agencies to detect financial instabilities, fraud, money laundering, and financial crime in advance, and operate based on these observations. While the common conception is that cryptocurrency wants to part ways from governments, I think we will soon realize that government should and will most likely be part of it in some shape or form. When we want to create an efficiently operating economy, we must facilitate the transition for both parties, finding compromises and agreements along the way. With Request, governments’ biggest argument against cryptocurrency will become void, as the platform will also benefit them directly, by helping people with taxes and social responsibilities while aiding the governments in prevention of illicit activity – they would simply have no arguments against it left. 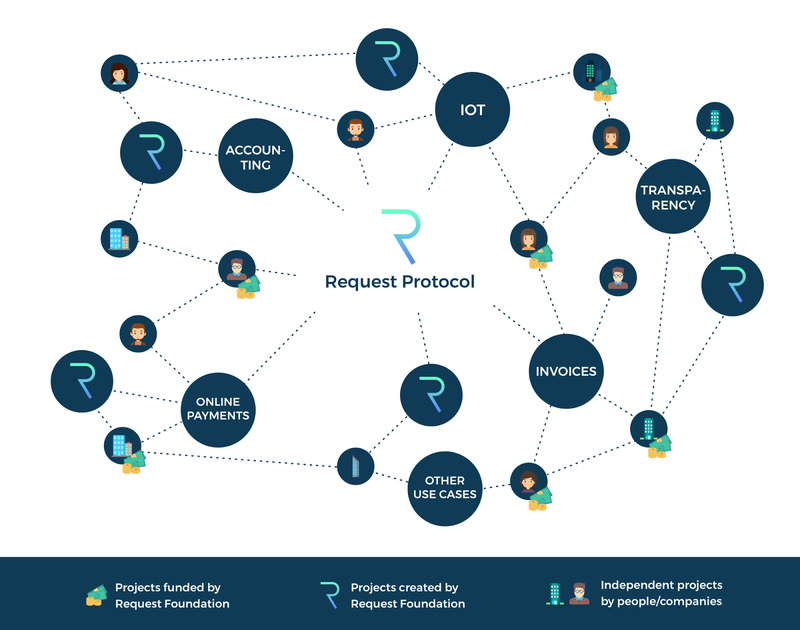 On January 19, Request team announced an update that they are setting aside 30 million USD to fund the development on top of the Request Protocol. While there was some unjustified FUD that Request is trying to “offload” work due to not being able to develop themselves, the real reasoning behind this announcement is very significant – to build a true ecosystem of developers developing on top of the core, similar to Ethereum and NEO. The Request Hub is basically a way to expand the scope of the project and introduce rapid scaling, adoption, and efficiency. People often forget that it doesn’t matter how many developer teams hire themselves, as they are never able to build and deploy every single app imaginable on their own – this is where the Request Hub comes to play. In simple terms, think of Request as a platform like iOS, where countless apps are developed by unassociated developers – Apple did not create all iOS apps by themselves. However, in addition to providing people the ability to introduce new projects on top of their protocol, Request also incentivizes it with a 30 million USD fund set aside to finance and help ambitious and beneficial projects get started. With every successful platform ever created, it has been opened up to developers to build the apps (or dApps), which brings mainstream adoption and scalability. Regardless of the FUD, this is the right move, and it allows Request developers to focus on the protocol level, while independent devs (with the funding of Request) can work on various apps/websites/buttons/widgets/plugins that work with the protocol. 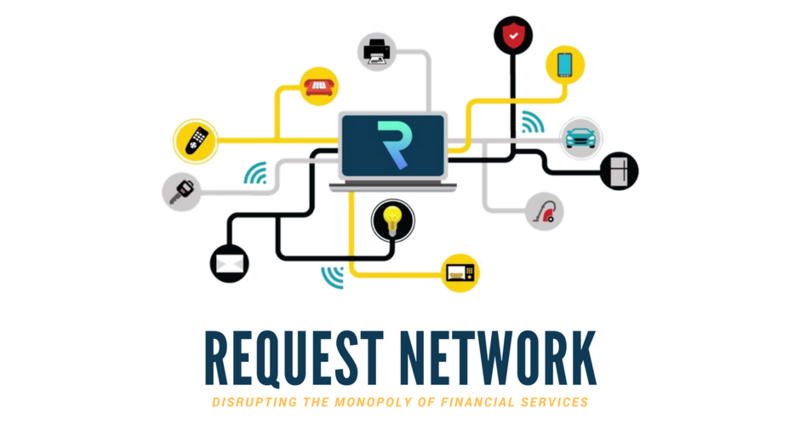 While Request can prove that it has become superior to all of its competition, it is still at very early development stages compared to the powerhouses. Furthermore, it won’t be easy to gain market share against organizations that have been facilitating our transactions and finances for decades, especially when it will require a fundamental shift in how we manage our money. Request also can’t rely on those giants to just surrender, even when Request is able to prove its benefits. Blockchain development is already on the competition’s checklist (Visa is currently hiring and deploying more blockchain developers), and we can be sure they will do anything to remain competitive. Still, Request might have the most ambitious goals and the biggest competition to overcome, but there are countless reasons to stay hopeful; the other companies will always seek to hold on to control over our money in one shape or form, while Request strives for complete decentralization with added benefits currently exclusive to them. Scaling is another discussion of concern, as Request has decided to use Ethereum as their platform of choice. Ethereum, however, currently has a lot of bugs with smart contracts, and it suffers under scalability problems. While this concern can be overcome by Request moving to another platform in the future if Ethereum doesn’t provide them the scaling they need, having to move over and adapt to another platform will still hinder development. However, there are also reasons to stay hopeful regarding this concern, as Ethereum is arguably the frontrunner in blockchain development and will give everything to create a scalable platform. With Casper and updates like sharding, Ethereum can potentially scale very well, and considering we are still in the very early stages of cryptocurrencies in relation to the grand scheme of things, scalability will most likely mature with time. Request Network is definitely impressive, and it attempts to fix one of the most fundamentally problematic areas of personal and corporate finances. However, this fight will not be easy as they come up against giants that have provided us financial services for decades. With one of the most needed and viable use cases in the financial industry, their highly anticipated 2018 roadmap, and impressive backing, Request Network has the capacity to grab a lot of highlight in 2018 if they are able to achieve development goals and deliver before the competition adapts to the changing space of finances. For more about Request Network, please refer to their BLOG.